In recent years, it seems that every video game and his dog has to have some kind of seasonal tie-in. This December, I’ve been eviscerating deranged elves, reindeer and gingerbread men in Killing Floor 2, beating cyberpunks to a pulp with a candy cane while dressed as St Nick in Ruiner, garrotting old Santa himself in HITMAN, and sprucing up the cockpit of my Imperial Cutter with fairy lights and a Christmas-tree bobblehead in Elite: Dangerous. Not that I’m complaining, it’s been great fun. Yuletide reskins are nothing new though. Thanks to the once lively culture of cover tapes/disks, we were occasionally treated to festive promotional video-game shenanigans even as far back as the 1980s. 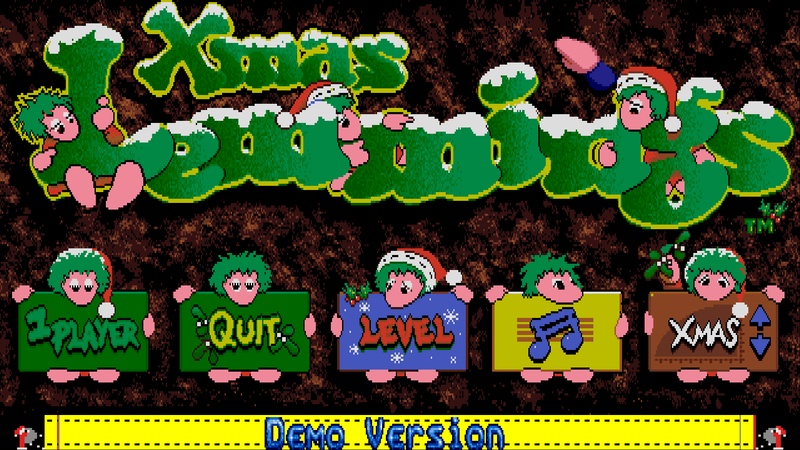 Classic examples include Moley Christmas (1987 Your Sinclair), Fire and Ice Christmas Special Edition (1992 Amiga Power), Cannon Soccer (1993 Amiga Format) and the delightful Xmas Lemmings (1991-4), which is the subject of this little piece. For those too young to remember, or if you were living under a rock at the time, Lemmings was a phenomenally successful action puzzler published by Psygnosis in February 1991. Not only did it spawn a whole series of sequels, expansions, spin-offs, and remakes (the most recent being 2014’s Lemmings Touch on the PS Vita), but the original game itself is estimated to have sold an incredible 15-20 million copies, making it one of the best-selling games of all time. Well, it was ported to virtually every platform that existed during that era – I actually remember playing it on an Acorn Archimedes at school and apparently there was even a Speccy version. Of course, developer DMA Design (known as Rockstar North these days) would go on to enjoy even greater success with the Grand Theft Auto series. The premise of Lemmings is simple yet insanely addictive. You’re tasked with guiding a group of up to 100 gormless but indefatigable green-haired rodents through varied and destructible 2D landscapes. Without intervention, they’ll cheerfully march in the same direction until they either perish (usually by plummeting en masse) or are forced to turn back around. Control is largely indirect. You have a limited number of special abilities that you can assign to individual lemmings – things like climb, build, dig, parachute, block and, everyone’s favourite, explode. And if it all goes pear shaped, you can nuke the bloody lot of them and start afresh! The Xmas Lemmings spin-off began life in December 1991, as a four-level demo given away on the cover of Amiga Format (issue 30 Jan 93) to promote Lemmings and its recently released sequel Oh No! More Lemmings. It was then followed up at the end of 92 with another four-level demo. The popularity of these free mini-expansions resulted in two full retail releases, Holiday Lemmings 1993 and 1994 respectively (Christmas Lemmings in the UK), each boasting 32 new levels divided into two difficulties. 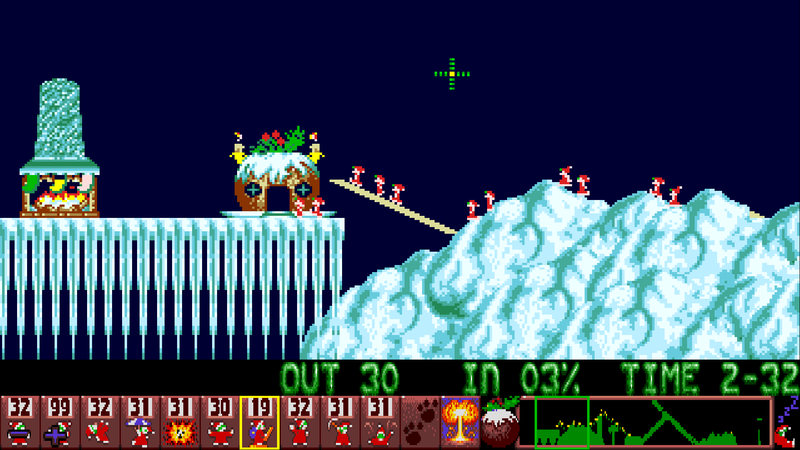 I love the original Lemmings – I’m currently working my way through all the levels again – but I think I love Xmas Lemmings just that little bit more. It’s basically the same game with the same satisfying and challenging lateral-thinking style puzzles, but the cuteness and silliness factors have been ramped up even further. Folksy ditties like She’ll Be Coming ‘Round the Mountain, 10 Green Bottles and the Can-can have been replaced by seasonal staples Rudolf the Red-nosed Reindeer, Jingle Bells, and Good King Wenceslas, all composed in that inimitable Amiga mode. Our furry little friends have been robed in Santa costumes. They now drop out of a huge floating present and need to head over to a giant Christmas pudding. And we find ourselves in snowy grottos and red-bricked chimneys decked out with bouncing snowmen, icicles, strobing fairy lights, swaying jack-in-the-boxes, roaring fireplaces, holly, and mini Christmas trees. It’s just the perfect game to play on those frigid holiday mornings while sat beside the tree, wrapped up in a warm dressing gown and sipping on a big, hot mug of freshly-brewed coffee (black, of course!). Nothing quite says Christmas like marching a century of hapless lemmings off an icy cliff or nuking them to see if it improves the surrounding decorations. Yup, Xmas Lemmings will always remain a holiday tradition in this household! ← Do you remember… the music from RoboCop on the Speccy? Well, of course I do remember it since it was the first Lemmings game I played and probably the most charming Christmas-themed game in my life. Its chiptune version of a Christmas song was incredibly catchy and I heard it inside my head hours after finishing playing. Great memories with this one, maybe playing it each winter should be my Christmas tradition too? Thanks. It should be everyone’s Christmas tradition!! !